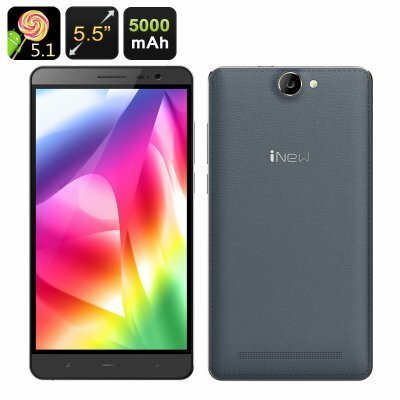 Successfully Added iNew L4 Smartphone - 5.5 Inch 1280x720 Screen, MT6735 Quad- Core CPU, 5000mAh Battery, 4G, Android 5.1 (Black) to your Shopping Cart. The iNew L4 Android smartphone comes with a large 5.5 inch screen for all your media, 4G coverage for great connectivity and the latest operating system so you can stock up on all the apps and tools you want. One of the key features of the iNew L4 is the smartphone’s great battery life. While other devices may let you down right in the middle of an important conversation or demand to be recharged at the worst possible moment – the iNew L4 sports a massive 5000mAh battery to cover all your needs. With the iNew L4, you get up to 25 hours of continuous talk time and 480 hours on standby. Problem solved. Make full use of the phone’s great battery life by watching all your favourite media or browsing the web on a nice 5.5 inch screen with 1280x720 resolution. With Android 5.1, you can also get more fun apps directly from the Play Store and enjoy Android’s intuitive user interface as you do it. The smartphone comes with two cool navigation shortcuts - Smart Wake and Gesture Sensing. One lets you get to your favourite apps right from the locked screen, while the other makes skipping tracks or moving between apps a matter of a hand wave. With a powerful quad core processor to back up your whole operation, 4G connectivity and the support of two SIM cards, the iNew L4 Android smartphone comes with great value for the price. The iNew L4 Smartphone comes with a 12 months warranty. Brought to you by the leader in electronic devices as well as wholesale Android Phones..